Brown meat in a large saucepan and drain. Sprinkle taco seasoning over meat. Stir in chili beans, tomatoes and 1/2 cup salsa. Cover; bring to a boil over high heat. Reduce heat; continue to simmer 10 minutes. Stir 1 cup cheese into chili; ladle into bowls and top with remaining 1 cup cheese. Serve with sour cream, cilantro, chopped onion and salsa, if desired. 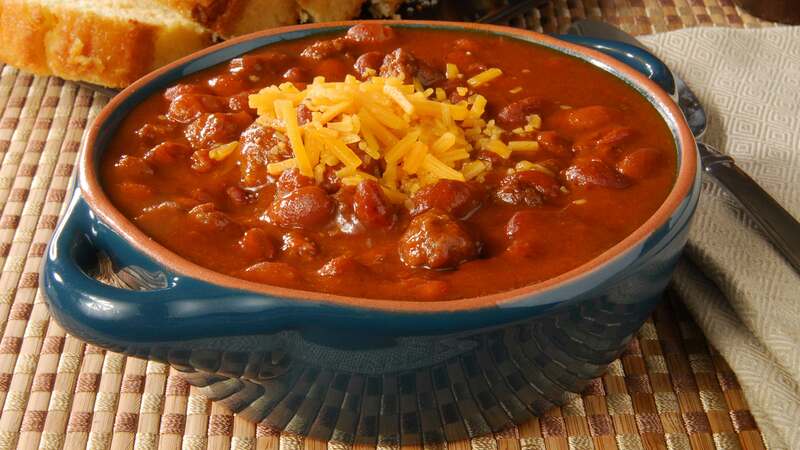 At this point, chili may be cooled, covered and refrigerated up to 4 days or frozen up to 2 months before serving. Reheat and proceed as recipe directs.